Väinämöinen was the sister ship to the Ilmarinen, flagship of the Finnish Navy. Both were designed as coastal defense ships to protect Finnish interests, particularly the demilitarized islands of Aland. However, both had poor sea-keeping abilities, and tended to roll too much on the open sea. Despite these limitations, the ships were heavily armed with four ten inch guns, housed in two dual turrets. Also, both coastal defense ships hosted a great deal of anti-aircraft guns. Väinämöinen and Ilmarinen's first action in the opening stages of the Winter, then the Continuation Wars, the conflict between Finland and Soviet Russia, first moving to the Aland islands to protect them. However, in December the ice became impassible, so both ships steamed to the region of Finnish Turko. There, they added to the city's defenses with their anti-air compliment. Next, Väinämöinen and her sister lashed out with their 10 in. guns, shelling Russian positions during the Red Army's evacuation of their Hanko Peninsula base. Following this action, both ships saw action in the Finnish-German "Operation Nordwind", designed as a distraction measure to occupy the Red Fleet's attention while German troops seized the Estonian islands. Unfortunately, Ilmarinen was lost, having entered a minefield and sank. After this, Väinämöinen was tasked with patrolling the Gulf of Finland and the Finnish-German anti-submarine net across the gulf. In 1944, the Soviets made the sinking of Väinämöinen top priority, and sent a massive air strike after the coastal defense ship. Scouting aircraft found a large vessel anchored in the Kotka harbor, and the massive sortie of aircraft attacked, despite fierce resistance from the ship's AA, sunk the vessel. However, it was later found that the ship sunk was not the Väinämöinen, but a flak cruiser lent from Germany named Niobe. Finally, with the Continuation War coming to a close, the surviving Väinämöinen was given to the Soviet Union along with war reparations. The ship was renamed Vyborg, and served with the Soviets until it was finally scrapped in 1966. In effect, Väinämöinen is an Axis cruiser with extended range. She is not very durable, and the large caliber of her main battery is offset by the small number of guns. 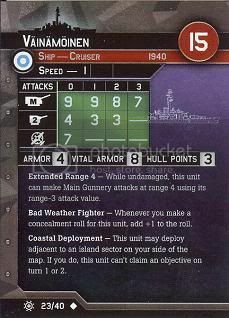 Her Coastal Deployment ability offers an interesting tactic: If you deploy her aggressively, her long-range guns can threaten sectors deep in your opponent's side of the map from very early in the game. With speed one, and the ability to deploy forward, this Ship begs to be paired with a submarine for some sort of combined arms tactic. There is clear synergy with the decent 7AA score to keep torpedo eliminating air based ASW attacks off of your subs, and Just enough secondary gun to 'Finish' off crippled destroyers. If used as a sub protector, the range 4 guns don't mean a whole lot as they can't target DD's. Good synergy with RM fleet using smoke, and the forward deploying San Giorgio, or with German Schleswig-Holstein and Atlantis, But if you only had 15 or so points, you might stretch it to 17 to add a San G. into a build instead of this fine Finish friend. 2x Väinämöinen (class limit) for 30 points is one of the pillars of an Axis forward deployment build. Not bad at all, but kinda weird looking (like the real life ship). They are so cheap you can practice painting and modding on them with near impunity.